Ask college football fans across the country which head coach/coordinator duo they’re most looking forward to following in 2018, and I’m sure the tandem of Mario Cristobal and Marcus Arroyo wouldn’t come up too often. 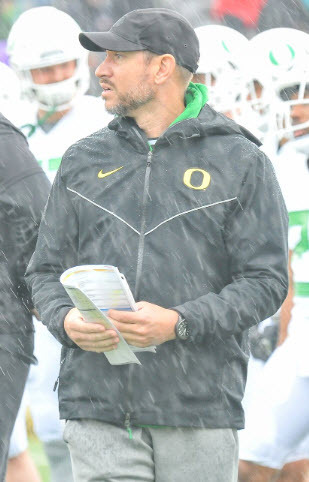 It may not be the most publicized story line nationwide, but those who follow Oregon football know that Cristobal and Arroyo are in the process of designing a brand new offense that will be a significant change from the previous offenses the Ducks have fielded. The schematics of this new offense have been analyzed by many this offseason, but perhaps the most intriguing variables are the men who are engineering it. Cristobal and Arroyo are polar opposites in their offensive approaches. Yet much of the success of the Ducks’ offense hinges on the two coaches’ ability to integrate their contrasting offensive principles and accentuate the strengths of both philosophies. This could result in a system that sets a new standard for programs across the country, and one that puts the Ducks back on the national stage. Cristobal is the type of coach who gets more excited by a pancake block than a one-handed catch. He’s a hard-nosed, old-school former lineman who coaches the same way he played — with an emphasis on physicality and the ability to win at the line of scrimmage. Offensively, his goal is to out-muscle opponents and pound them into submission. He doesn’t profess to be a master strategist. Instead, Cristobal is an expert at teaching his linemen the basic tenets of leverage, technique and positioning. Rather than run exotic schemes, Cristobal relies on his ability to groom linemen who are bigger, stronger and more fundamentally sound than their defensive counterparts. Couple that with his ability to recruit elite talent on the offensive line, and ideally there will be no need to install a fancy, new-age offensive system. Cristobal is a throwback who prides his teams on their physicality. This strategy has proven to be successful. Cristobal won a national championship as the offensive line coach at Alabama, largely by following this blueprint. The Crimson Tide recruited big, talented players, especially in the trenches, and they executed a few, basic schemes better than anyone else. However, Cristobal also realizes that what worked before is becoming increasingly difficult to replicate in today’s landscape. The talent gap between teams is shrinking, and it’s no longer practical to expect wins from sheer talent and flawless execution of a handful of plays. Even though Cristobal is an excellent teacher of the basic fundamentals of power football, his old-school approach may not be diverse enough to succeed in today’s game without some variation. That’s why he’s sought the expertise of a young offensive visionary who has spent his career perfecting his craft on the west coast. Marcus Arroyo is hoping he will have more success at Oregon than at his previous stops. Arroyo’s path to Eugene has lacked the championship record of Cristobal’s. The former San Jose State quarterback has bounced around from place to place throughout his career, and his offenses haven’t exactly set the world on fire. But a closer look at his background shows why he is essential to the Ducks’ offensive success in 2018. A creative, intelligent offensive mind, Arroyo has gained a wealth of information from some of the most respected offensive coaches in the sport throughout his career. Their influence on the well-traveled coach has given Arroyo the tools to build his own offense, which combines the benefits of each of his predecessors’ systems. 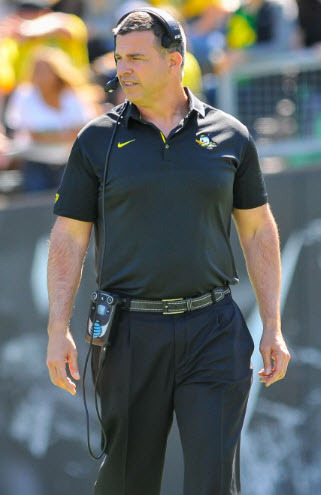 At Southern Miss, Arroyo coached under Todd Monken, a disciple of Mike Gundy and a coach who ended up making Southern Miss a contender in their conference. At Cal and at the NFL’s Tampa Bay Buccaneers, he was mentored by Jeff Tedford, with whom he learned how to design a potent passing attack. Tedford isn’t a “spread guy” at his core, but he is a well-renowned quarterback whisperer who helped groom Aaron Rodgers during his time at Cal. 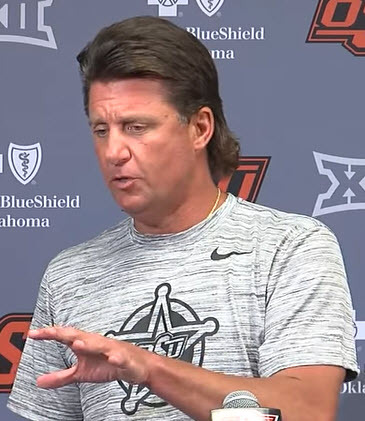 In Arroyo’s most recent stop, he worked under Gundy directly at Oklahoma State, where he got an inside look at Gundy’s version of the air raid offense — an offense that has been one of the most explosive in the country this decade. Arroyo learned valuable lessons from Mike Gundy during his time at Oklahoma State. These experiences gave Arroyo an advanced knowledge of the benefits of a quarterback-friendly, spread offensive scheme. He has learned how to use elements such as tempo, extreme wide receiver splits, shot plays and pre-snap motion to create numbers advantages for the offense and to stress opposing defenses at every level. 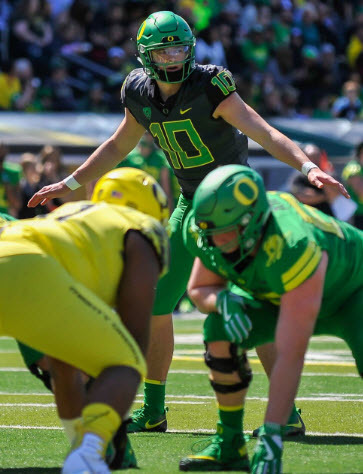 With the reins to the Oregon offense, he now has the opportunity to put his skills to the test and show off his own, personalized version of a lethal spread attack. Cristobal’s smashmouth approach is a great foundation. The basic principles of fundamental offensive line play and emphasizing physicality are critical elements to build an offense on. However, without the strategic advantages that Arroyo’s spread influence brings, they wouldn’t be enough to win a championship. The Ducks’ offense in 2018 will be a combination of both Cristobal and Arroyo’s offensive styles. The combination of these contrasting philosophies makes the Ducks’ offense one of the most intriguing story lines in the entire country. Neither truly spread nor smashmouth, the Ducks’ offense is unique. If this reconstructed offense works out, it could mean big things for the Ducks moving forward. Not so long ago, a little-known offensive coordinator named Chip Kelly came to Eugene and introduced an offensive scheme that changed the the college football landscape. 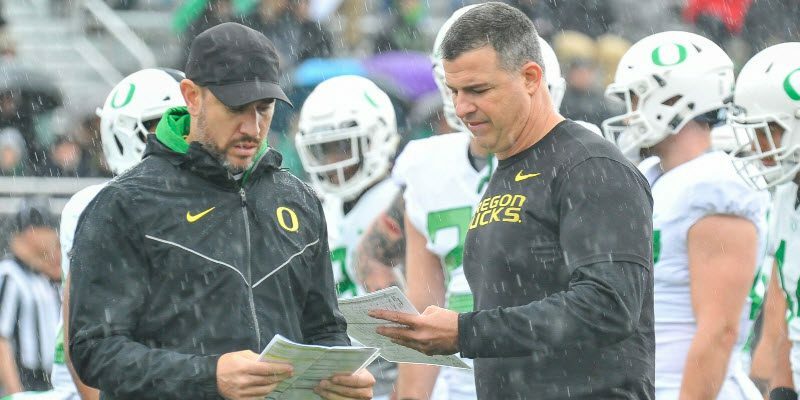 Can this new dynamic duo of Cristobal and Arroyo make lightning strike twice, leading the Ducks into another offensive renaissance? Only time will tell, but meanwhile, all eyes will be on the Ducks to see whether this experiment will be part of the future of college football or a passing fad.